The Fox Foundation works with its community, non-profit, and corporate partners in order to bring a taste of the theater to local area schools, through coordinated assemblies with performing arts professionals touring through the Fox Performing arts center…and also helps brings area students to the stage at the Fox Performing Arts Center through deeply discounted or free access to the venue for school district-wide special events. Sponsored the Broadway tour cast of STOMP! 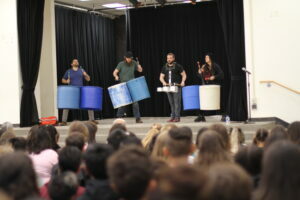 to perform at an assembly for children in the Alvord Unified School District, complete with barrels, drumsticks, tic tac shakers, and a cast chat Q&A. 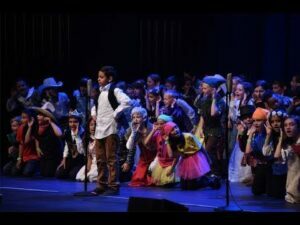 The 300 students were captivated by the crew, who led the audience through their very own rhythmic call and response, similar to what is done in the live, on-stage production. 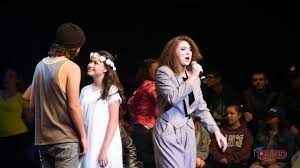 Facilitated and sponsored Riverside Unified School District’s first ever High School Honors Musical, a which brought top high school theater students to the stage at the Fox to perform a special adaptation of Romeo & Juliet, written by a RUSD alum. A feather in our cap is that our very FIRST set of Live Tech graduates were able to work behind the scene to support the Live Nation tech crew in putting on the show – assisting them with lighting, audio, and stage management.